Harvestmoon Valentine Stout is an annual Valentine’s day release by Harvestmoon Brewery. It usually goes on sale from late December and it is a 7% stout beer packaged only with this special label, which is unlike some breweries that repackage their existing beers with a different label. Similar to this recipe is Harvestmoon Coffee Stout, which builds on it by infusing it with fresh coffee beans. Treat your Valentine with some special beer. 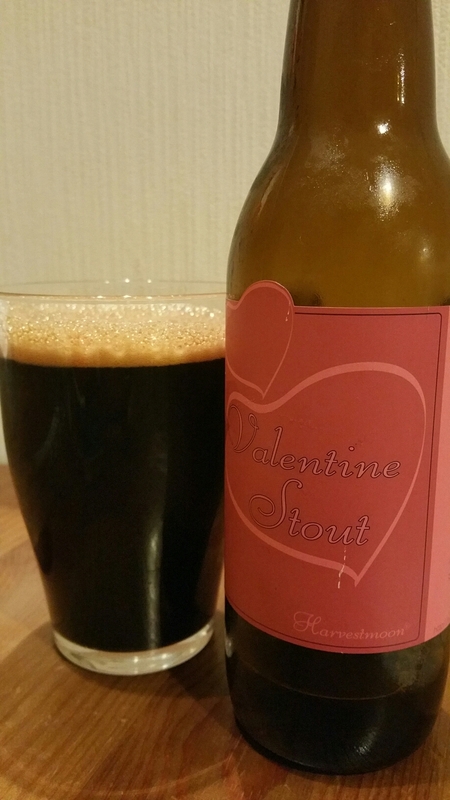 I’m still at a loss why stouts have become THE beer for Valentine’s as there is plenty of chocolate flavours already out there, but the more the merrier as far as my wife is concerned. She’s a stout fiend so I thought I would let her have some say in this review. From the first drop out of the bottle, it’s easy to see why Harvestmoon make their Harvestmoon Coffee Stout out of this, as Harvestmoon Valentine Stout had a strong resemblance to a well-pulled espresso with a thick layer of crema (foam) on top. A beautiful thing to look at no matter what time of day, though the malty sweet aroma pulls you back from the coffee resemblance. The body, though, was more stout-like than coffee, with the strong chocolate malts coming through with a smoky punch. But don’t fret, the coffee taste followed up without the silky crema taste that is associated with espresso. Harvestmoon Valentine Stout also had a bitter, creamy aftertaste that felt like someone had added some fresh cocoa powder to the beer without us looking. Harvestmoon Valentine Stout is a nice stout that would be welcome any time of the year, not just for Valentine’s.